In the dusty annals of history, down in the stack section the world’s research libraries and other repositories of knowledge, how will North Korea’s year be marked by the texts, narratives, and sources? This year has been a year acutely schizophrenic in nature and circumstance, from the hysterical high of blood curdling threats, missile tests, B52 flyovers, trans-Pacific anxiety, the intervention of Dennis Rodman, and the potential extermination of the Moranbong Band, to what seems like a post summer lull (although the incarceration of an American veteran could flare up in an instant if required by either side). The Byungjin line, outlined by Kim Jong-un earlier in the year, the ideological manifestation and crystallization of a rather robust approach to diplomacy and institutional development, to an extent remains a mystery. Deeply and intelligently analyzed by some, to the more acute observer its core appeared dualistic: the coupling of aspirant, thrusting, technological, nuclear futures and a developmental approach with a distinctly old fashioned nature, all enthusiasm and energy harnessing enthusiasm and mass participation. Byungjin itself connected with developmental themes in Pyongyang’s institutional mind(s), already present and articulated in the New Years Message for 2013, which heralded from a much longer term paradigm of construction. 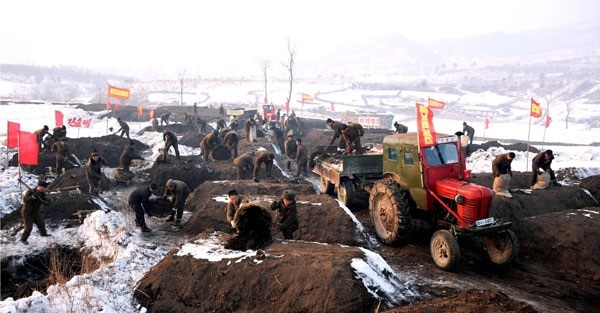 The reclamation of Sepho ‘Tableland’ appeared within the DPRK narrative for the first time in December 2012 (an earlier article by this author recounts its early presentation), and had seemed, until the rise of the bombastic project at Masik Pass (and “Masikryeong Speed”), set to be North Korea’s primary developmental focus for 2013. Although this, primarily thanks to the dramatic usefulness of Masik Pass, has not proven to be so institutional and thus focus on Sepho has not waned; on the contrary other aspects of development have been rekindled, re-articulated, or in fact articulated for the first time thanks to progress at the Reclamation Project. In contrast to the enormity of Masik, however, what has characterized work at Sepho (and this is in-spite of its apparent scale) has been its connection with quieter themes of personal, political and nationalistic internalization and charisma. In another previous essay, this author discussed the role different projects and approaches play within North Korea’s narrative and developmental structures when it comes to inculcating or extrapolating political or ideological themes. I termed this process “scaling” or “rescaling,” originally a word in the field of political ecology that describes a process allowing for the politically “thick” or dramatic to be reconfigured so that it can be utilized on a human, personal scale outwith and beyond the realm of “the mass.” Such scaling has been much in evidence at Sepho and institutional fields connected to it. Images of Sepho’s fields and enormity abound, it is true, but it is equally true that along with the tractors, trucks, and other agricultural and industrial machinery, individual humans can be seen at work, embedded within the Sepho landscape. 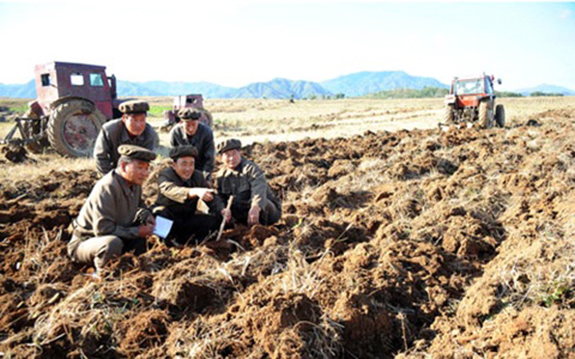 From soldiers toiling in the frozen peat of winter 2012-2013, to technicians and “soldier-builders” examining and engaging with the verdant grasses of summer/autumn 2013, the individual (even if working within their army unit, or shock brigade) has been very much in evidence in the project. This author would posit a connection here: between the fascinating narratives of scaling, connectivity, and incorporation of national patriotism and political charismas present in the 2013 Spring Land Management campaign referred to as “patriotism begins with a love of courtyard,” and the wider developmental landscape as represented by the Sepho project. Patriotism, that is the active form of North Korean politics in the non-political field, has been embedded and disseminated in many forms this year. If Charisma and the Charismatic form of the political is given its initial energy by narrative and legitimative authority, it is scaled into the realm of the personal or the natural by the “carrier signal” that is patriotism. Sepho’s continued construction and development have been demonstrative of this scaling and of the action and activity of this form of patriotism. Writing by this author elsewhere has worked towards a codification of the charismatic forms present within the political superstructure of the North Korean institutional mind, a codification which identifies three forms of the charismatic in function and output (Charisma’s of “Struggle,” the “Monolithic,” and “the Participant”). Patriotism and politics inherent in activity this year at Sepho characterize a belonging to “the participant” variety. On Sepho’s fields and spaces politics and the ideologically charismatic have been acted out and incorporated within the landscape, within the infrastructure, within the grass itself. Sepho as a space has become participant within the politics and political structures of North Korea under the Byungjin line in 2013. However, this participation, this connectivity of Sepho and its grassy landscapes, is categorically different from “the participant” and participants elsewhere. 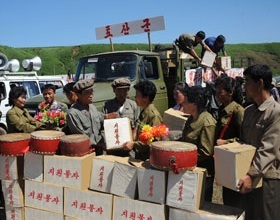 In a sense all of these charismatic forms are participant, from the text of unearthly glow at Kim Jong-il peak at the time of his death to the tidy and apparently flower strewn streets of Phyongchonin spring, all are incorporated within the field of politics and all acted upon by modalities of ideological expression. Sepho in its wideness, sometimes in its emptiness, but primarily in either the almost visible swishing of grass fronds or the determined contemplation of the operatives and technicians working within its quietness and quietude, is different from these other participant forms. This author seeks to term therefore the participant mode manifest there “quiet charisma.” Just as there are thick and thin versions of politics and the political, in North Korea (and presumably elsewhere in theatrically inclined political formations), there must be “loud” and “quiet” forms of the charismatic. Intriguingly, while 2013 has very much been a year for the charismatically “loud” (“loud” at Masik Pass, “loud” in the Byungjin line, “loud” on the pad for the launch of Kwangmongsong), in developmental terms it has also been one which mirrors the diplomatic schizophrenia mentioned in the introduction to this piece, correspondingly a year of “quiet charisma” at Sepho. 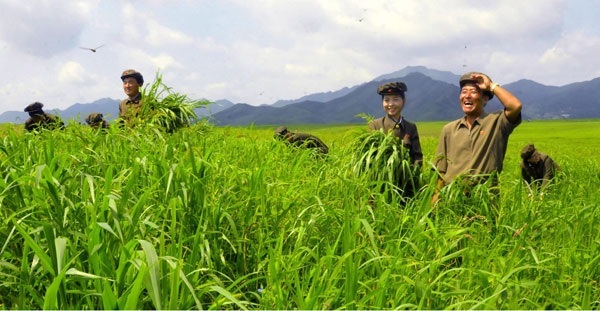 Sepho therefore leaves us and North Korea’s narratology at the end of 2013 as one end of what seems to be a spectrum of developmental and political possibility, far from the bombast of Masik Pass but nevertheless connected by virtue of its charismatic content. Sepho and the “quiet” charisma of “patriotic courtyards” seem an oddity in this year of Byungjin, but essentially form the other side of the tumultuous and bombastic coin that is North Korean ideological construction. Sepho and its “quietness” have perhaps allowed for other elements of this steadier, slower developmental to function within the year, hence the extensive focus on the Central Mushroom Institute of Pyongyang and fungal developmental matters and earlier on faunal production focused on more esoteric species (ostriches, bullfrogs and terrapins, for example). It is undoubtable that such themes will reappear in 2014 and the incoming New Year’s Message, whether Sepho itself does directly or not. The very recently published FAO/WFP Food and Crop Assessment mission report (published on November 28) perhaps suggests that the Sepho project’s currently stipulated aim (the production and building of a “large scale” cattle breeding station), would be both vital to correct food production issues that apparently still lead to nutritional deficiencies in the population, and to support the development of alternative strategies for meat and protein production other than rabbits, cattle numbers having plateaued since early in the century. In this case, Sepho, its “quiet charisma,” and the developmental possibilities attendant within it will be sorely needed in 2014, just as they were in 2013 and in every year north of the 38th parallel.